Starring Taron Egerton, Jamie Foxx, Ben Mendelsohn, Eve Hewson, Tim Minchin, Paul Anderson, F. Murray Abraham, Ian Peck, Cornelius Booth, Scott Greenan, and Jamie Dornan. A war-hardened Crusader and his Moorish commander mount an audacious revolt against the corrupt English crown in a thrilling action-adventure packed with gritty battlefield exploits, mind-blowing fight choreography, and a timeless romance. Forget everything you know about the English folklore and the various multimedia interpretations, this right here, directed by Otto Bathurst from a story cooked up by multiple names (you don’t even need to read the credits to know this, as the tone is all over the place, as if both writers were taking on different characters with different approaches for Otto to then smash together), is the real, for real real, true untold story of Robin Hood. 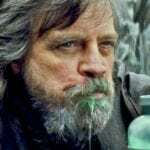 It’s an opening statement that has seemingly become commonplace among reimagined origin stories, and unfortunately, the clichés and nonsense don’t stop there. It’s also mentioned that the time doesn’t really matter, which I suppose is fitting given the distracting anachronistic wardrobe any major character receives. This time it’s Taron Egerton (who will no doubt be ringing Fox once the critical reception and box office results come in for this disaster to get back into the Kingsman franchise sooner than later) stealing from the rich to give to the poor, although the direction has a strong emphasis on fast pacing with relentless suspenseless action sequences. Please, for the love of God don’t take that above-mentioned IMDb synopsis seriously, unless you also believe that mind-blowing action amounts to never-ending montages of Robin Hood firing off arrows laying waste to guards reminiscent to a video game (never once getting bruised or dirty) while the camera either enter slow-motion or speeds movements up overbearingly frenetic, as if the film is specifically designed for those with ADD. Characters discuss hitting the unfair Sheriff of Nottingham (a gloriously hammy Ben Mendelsohn, acting like a frothing rabid dog barking orders and insults that continuously get more ridiculous and edgy the more things don’t go his way) where it hurts, the excess in cash from the commoners funding his never-ending war crusade, but the more Robin Hood goes on it feels like watching someone that dropped into an Assassins’ Creed game ignoring all the instructions and stealth tips in favor of going around slaughtering as many generic enemy guards as possible. There are a few quick bits of him giving some money away here and there, which is still somehow more time allotted to developing characters. 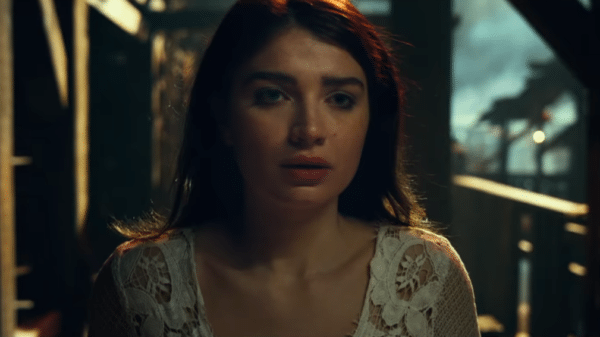 Eve Hewson plays Marian, with the relationship between the two established literally within two minutes and never once feeling real or worth investing in. Under the impression that Robin has died serving the war (a ludicrous and lengthy segment that plays out like Call of Duty in Arabia and with bows and arrows), we learn that she has found another significant other (Jamie Dornan of Fifty Shades notoriety, here trying to walk the line between pleasing the Sheriff of Nottingham and maintaining order over the common folk) upon his return home, effectively relegating her to the object of affection in a love triangle. She has no character to call her own, doing whatever generic task the film asks of her. The final 20 minutes take this dynamic to an outrageous level of cringe, stupidity, and unintended hilarity; I’m genuinely amazed that someone from Lionsgate didn’t watch a finished version and order a new ending based on the overwhelming sensation that this will not become a franchise and how easy it would have been to alter the final scene to refit the entire film as a complete story. 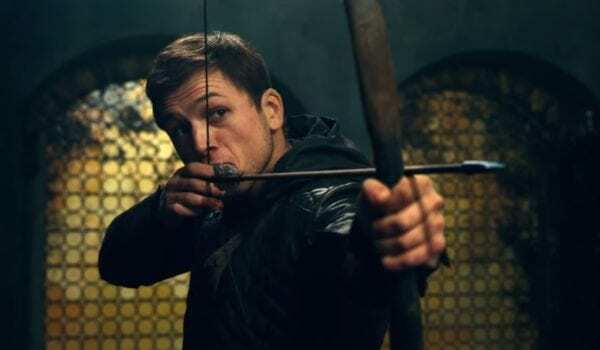 Nevertheless, someone working on Robin Hood seems to have, at one point, had more on their mind in terms of storytelling, as the film often is highly critical of the Catholic Church. There are various references of evil-doing here and there, none more explicit than the Sheriff of Nottingham briefly going into an expositional monologue about the physical abuse he has endured from their broomsticks as a child. For a moment, it seems the script might try to make a somewhat empathetic, two-dimensional villain, quickly dropping everything for more repetitive action. 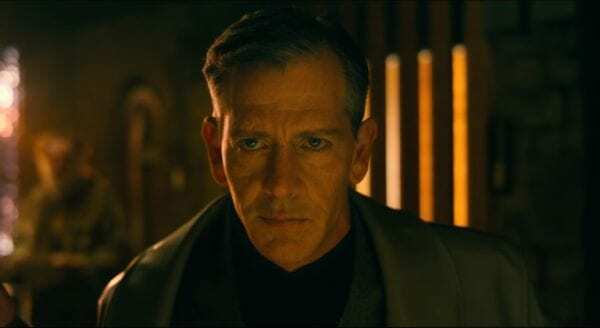 Frankly, that’s probably for the best; the story here is god-awful and I would rather see Ben Mendelsohn go for broke. 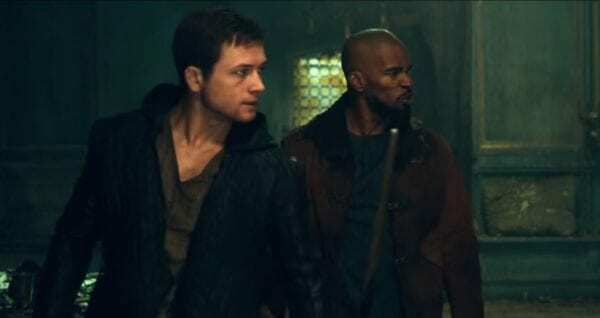 The rest of the supporting cast doesn’t have much to do either; Jamie Foxx is Robin Hood’s mentor but gets shockingly little screentime for someone seeking vengeance in addition to training the eponymous thief, and more characters are introduced as time goes on, none of them adding anything. F. Murray Abraham seems to be the only other actor aware of how silly this is, scoring laughs as the Catholic Church Cardinal. Thankfully, there are also some earned moments of intended humor from Tim Minchin’s take on Friar Tuck, but it’s safe to say you’ll be laughing throughout Robin Hood whether the movie wants you to or not, and sadly never engaged by the combat no matter how many arrows are fired. 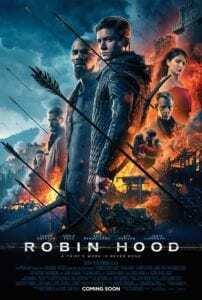 At least the sound design is fine; there is a part where John (Jamie Foxx) gives Robin Hood an upgraded bow (but not before a terrible and over-the-top flashy display of bravado that could have easily ended in disaster for him), which has immediately noticeable different sounds both from the arrows whizzing through the air and piercing wood on impact. It all makes up for the atrocious CGI, namely a ghastly looking quick segment showing horses trying to outrun fake -looking magma. Additionally, some of the set design is nice to gander for the estimated four minutes that aren’t comprised of action. There is also something to be said that it has to be impossible for anyone to fall asleep watching Robin Hood; it’s so loud and maddeningly dumb in its attempts to be exciting. The only one being robbed is whoever buys a ticket.